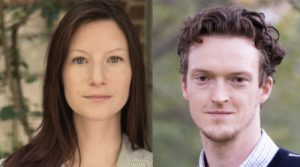 The Frank Batten School of Leadership and Public Policy today announced that Batten professors Christine Mahoney and Philip Potter have been selected by UVA President Jim Ryan as the University’s 2019 nominees for the Andrew Carnegie Fellows Program. Every fall, the Andrew Carnegie Foundation welcomes nominations to the highly competitive program from universities, research institutions, and news outlets across the country, building on the Carnegie Corporation of New York’s century-old philanthropic tradition of investing in creative scholarly research. Eligible universities put forward two scholars—one senior and one junior—whose research has gained recognition and is in sync with one of the Foundation’s chosen themes for that year. The selection of two Batten professors from a University-wide applicant pool is an honor for the Batten School as the youngest and smallest school at UVA. Both Mahoney, the senior scholar nominee, and Potter, the junior scholar nominee, have applied fresh perspectives and research to some of the most pressing issues facing society today. Their current work consistently shows potential for meaningful impact on their fields of study, and has the capacity for dissemination to broad audiences. Fellows program topics for high-caliber scholarship in the social sciences and humanities vary each year. This year’s program topics include: strengthening U.S. democracy and exploring new narratives; technological and cultural creativity—potential and perils; global connections and global ruptures; and environments, natural and human. In the spring, the Carnegie Foundation will select 35 exceptional scholars, journalists, and public intellectuals from the nominee pool to receive fellowships of $200,000. Mahoney’s proposal ties closely to the “strengthening U.S. democracy and exploring new narratives” theme. She has proposed building an advanced lobbying information system for the U.S. Congress in which interest group position papers would be publicly published and analyzed via content analysis and positional mapping. Members of Congress could easily find who is lobbying on a given issue, what they are arguing, and discern whose voices may be missing from the debate in one centralized system. Potter, who is also the director of Batten’s National Security Policy Center, has co-authored articles for The Guardian and been interviewed by The New York Times on the rising threat of terrorist attacks by Uighur militants in China, and has a deep understanding of the region and its threat to national security. Come April 2019, the Batten and University communities will have their fingers crossed for these two exceptional scholars who have already made a meaningful and lasting impact through their research and tireless work.